Vegan scones - a delicious, reasonably low fat treat! 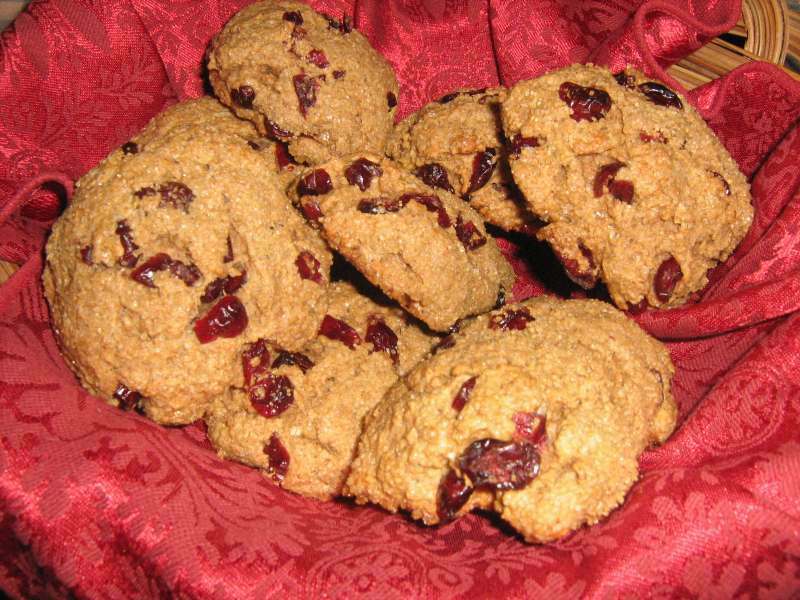 These Cherry Juice Infused Cranberry vegan scones are a tasty treat that will please your family and guests. They are delicious whether eaten warmed or at room temp., with a vegan spread or just as they are. 1/4 cup of turbinado sugar and the spices (cinnamon, nutmeg, allspice and clove). Add in the Earth Balance and, using your hands, turn the mixture into a fine crumble. Add the soy milk, vinegar and vanilla and mix together until a heavy dough is formed. It should be reasonably dense. Then mix in the Craisins untol evenly mixed throughout. Form into small mounds and roll each mound in turbinado sugar, coating the entire scone. Place the scones on a lightly greased or sprayed baking sheet. Bake for about 20 minutes, watching the scones to prevent burning. If they are still fairly moist on the surface after 20 minutes, allow them to bake an additional 5 minutes. Makes 6 to 8 small to medium scones.